Posted on Thu, Feb 9, 2012 : 3:45 p.m.
Join the "Cherry Lover's Wine Weekend Event" at Cherry Republic on Friday and Saturday. 9 a.m. to 9 p.m. Sample from their cherry wine collection and hundreds of cherry treats. All samples are complimentary. While you are there, get your Valentine's Day shopping done. Free. Cherry Republic is at 223 S. Main St., Ann Arbor. 734-585-5231. The ""Annual Ford Lake Frozen Leap" at Lake Shore Apartments takes place Saturday, from 10 a.m. to 2 p.m. This fun event raises funds for SOS Community Services. Want to make a splash on Valentine's Day? Learn to make "Dark Chocolate Swans Set Afloat" with Rachel Wolpo at Hollander's on Friday. 2 to 3 p.m. A pair of adoring dark chocolate cream puff swans are set in a pool of raspberry coulis with creme anglaise hearts enclosing them. They are gluten and dairy-free. $16. Hollander's is at 410 N. Fourth Avenue in the Kerrytown Shops, Ann Arbor. 734-741-7531. It's time again for "Wild Swan Theater's Sixth Annual Chocolate Crush Fundraiser" at Lake Forest Golf Club on Friday. 7:30 p.m. Enjoy fare by premiere chocolatiers and chefs, savory appetizers, beer from Wolverine Brewing and wine. Bring extra money for the auctions. Ticket prices per person are $60 for and $125. Tickets are available for purchase online at www.wildswantheater.org or by calling 734-995-0530. LFGC is at 3110 W. Ellsworth Road, Ann Arbor. "Love Is a DRAGshow" will be at Frenchie's in Depot Town on Friday. Doors open at 9:30 p.m. A bevy of glittering goddesses will present a drag queen extravaganza for a great cause. Donations made at the door and during the event will benefit the Ozone House Ypsilanti location and its programs. $5 suggested donation. Frenchie's is at 54 E. Cross St., Ypsilanti. 734-483-1035. 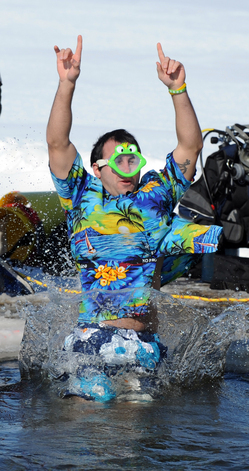 This mild winter may just be the year to do the "Annual Ford Lake Frozen Leap" at Lake Shore Apartments on Saturday. 10 a.m. to 2 p.m. This fun event raises funds for SOS Community Services. Those daring enough to take the plunge are required to raise a minimum of $50 and must have a team of three or more. The LSA are at 2117 Lakeview Dr., Ypsilanti. 734-482-2800. See “The Met Live in HD series: Gotterdammerung” at Rave and Quality 16 Cinemas on Saturday. Noon. Deborah Voigt stars as Brunnhilde and Gary Lehman is Siegfried—the star-crossed lovers doomed by fate. Tickets are available at participating theater box offices and online at www.FathomEvents.com. Rave is at 4100 Carpenter Road. 734-973-4823. Q16 is at 3686 Jackson Road, Ann Arbor. 734-623-7469. Enjoy "An Evening in Paris" the Chelsea Education Foundation Gala Fundraiser at the Chelsea Comfort Inn & Village Conference Center on Saturday. 6 p.m. Join in for an elegant evening in Paris, dinner and dancing, a cash bar,auctions and a raffle. $75 per person; $125 per couple. Reservations are required. For more information, go to chelseaeducationfoundation.org or email CEFinformation@gmail.com. The CCIVCC is at 1645 Commerce Park Dr., Chelsea. 734-433-8000. Fri, Feb 10, 2012 : 2:06 p.m.
Sunday afternoon's chili, beer &amp; Silent Auction at The Corner Brewery is also a best bet. This is the 3rd year to warm winter with some of the best chilis you've ever tasted, vegetarian included. Paired with samples of The Corner's winning beers, lucky door prizes or valuable, practical auction items, what fun! Fri, Feb 10, 2012 : 2:16 p.m. I agree! A2CT's Chili Cook-off, beer tasting, and auction is loads of fun. There will be lots of Valentine's Day-themed auction items, so you can eat chili, drink beer, AND find a last-minute Valentine's Day gift. Fri, Feb 10, 2012 : 2:12 p.m. I just remembered to mention that the Chili Cook-Off, Beer Tasting, &amp; Silent Auction benefits Ann Arbor Civic Theater, bringing community theater to our area for 80 years. Fri, Feb 10, 2012 : 4:58 a.m. Indeed. I know people get tired of hearing it, but maybe if we all complain long enough we'll get some copy editing around here. We all make grammar mistakes, but most of us don't get them printed in what claims to be a city news source. AA com, please hire some copy editors so these typos don't make it to the live page. Fri, Feb 10, 2012 : 3:06 p.m.
Thu, Feb 9, 2012 : 10:26 p.m.
Re. The Cherry Republic event on Friday and Saturday, it sounds lovely, but I should get my Valentine's Day shopping done while my what is there?